One food I’ll never buy is anything with coconut and chocolate. I have zero self-control over the combo. I don’t know what it is about the sweet coconut mixed with chocolate, but it is literally heaven. When I made this recipe, I took one bite and knew I had to bag most of them up and drop them off at my parents. I would have eaten them all in a day because they turned out irresistible. A few Sunday’s ago, I was walking through the grocery store, and I saw that they were selling coconut chocolate bites in the bulk section. I was disappointed that they weren’t dairy-free because I wanted to have one. 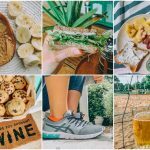 This inspired me to pick up some ingredients and make my own. 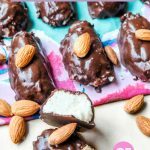 Back in the day, I’d always make my family almond joys for Christmas, and I had the perfect recipe to replicate them. I wanted to do a similar recipe but with some swaps to make it gluten free, dairy free, and vegan. I’m so happy with how they turned out! 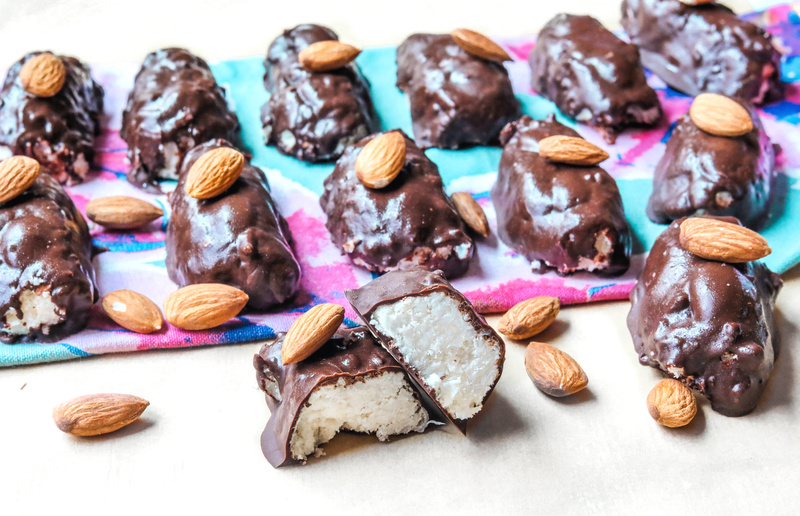 If you’re an Almond Joy lover, you’ll want to add this recipe to your list. 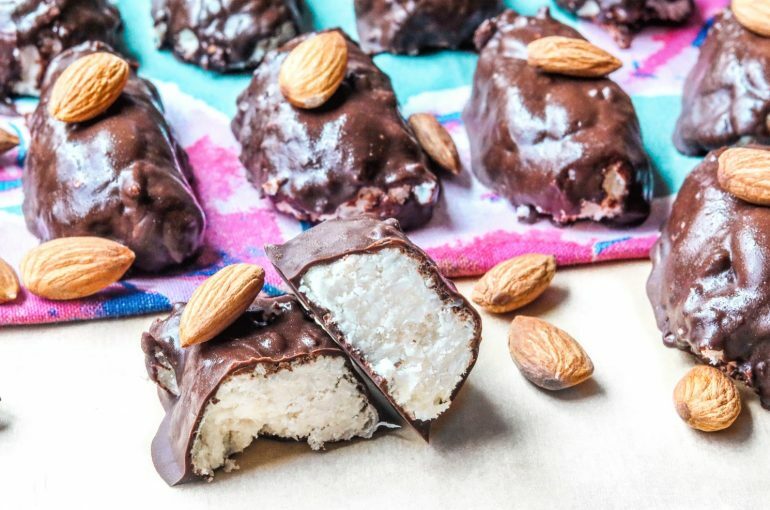 You only need nine simple ingredients to make these: unsweetened shredded coconut, sea salt, unsweetened almond milk, coconut oil, agave, coconut flour, almonds, almond extract, dark chocolate chips. For my chocolate, I almost always use Lily’s Vegan No Added Sugar Dark Chocolate Chips. If you’re going to use a replacement sweetener, I recommend going with a liquid one. If you do a dry sweetener, they may not stay together as well. I added in the milk gradually to make sure the texture was just right. You may need more or less depending on how much the coconut flour absorbs. If you’re able to form a large ball, the consistency should be good to go. 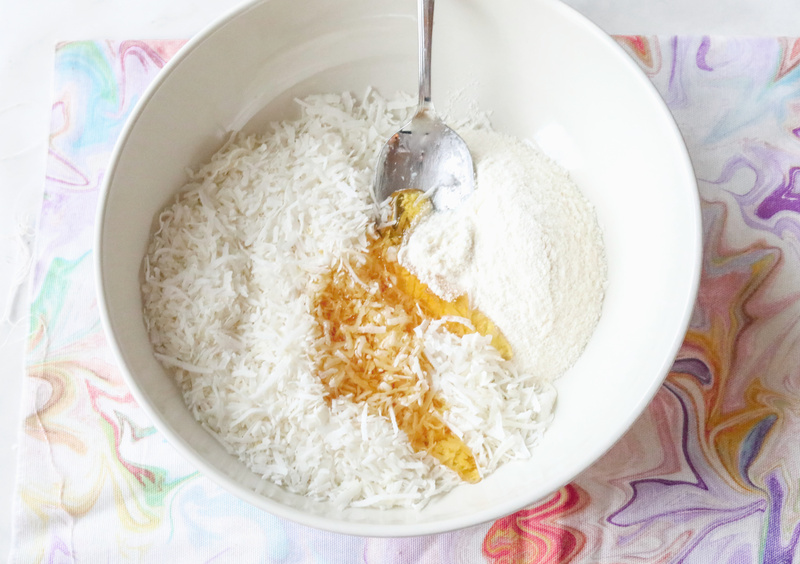 Add the shredded coconut, sea salt, and coconut flour to a large mixing bowl. 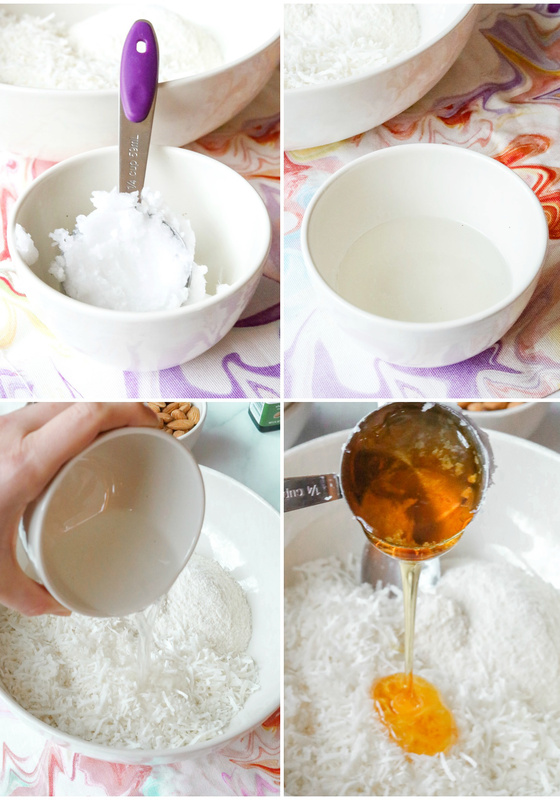 Melt coconut oil and add to the mixing bowl with agave and almond extract. Mix well. 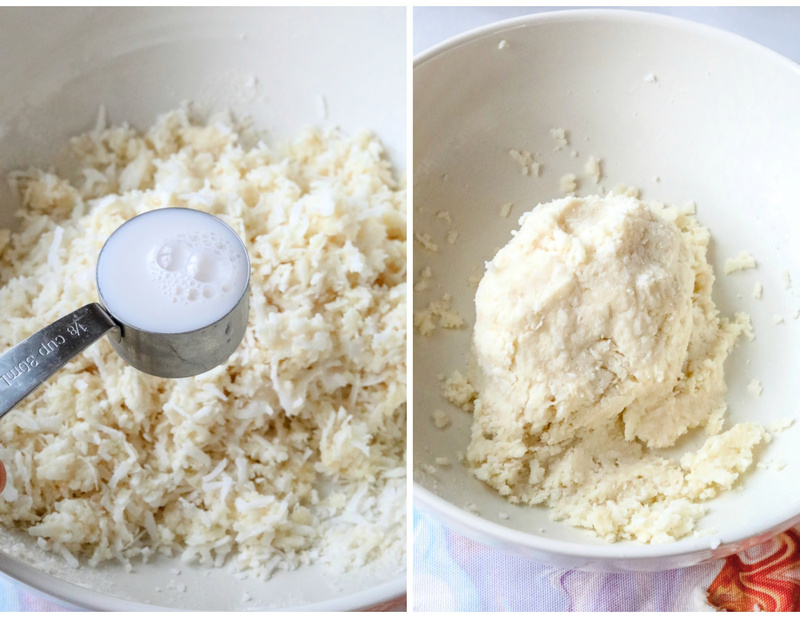 All of the coconut shreds should be coated and flaky. 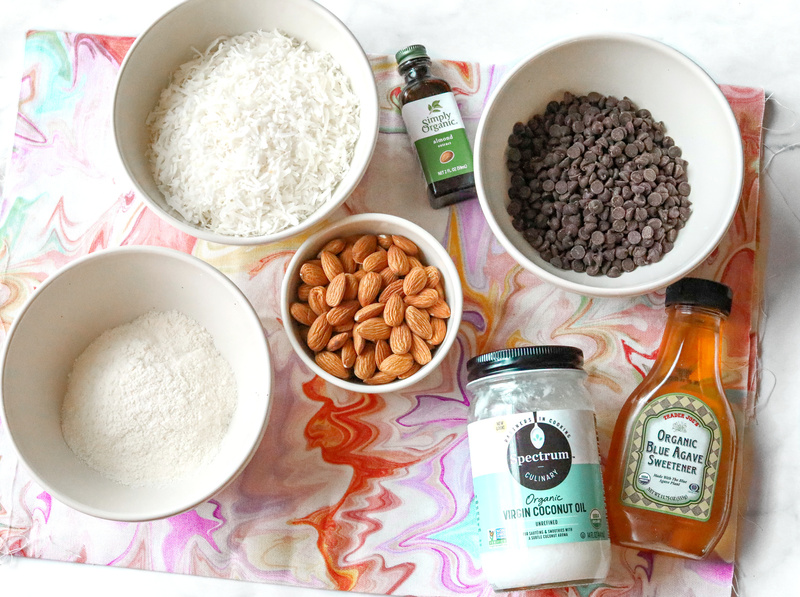 Gradually add the almond milk to the mixing bowl. You should be able to form the mixture into a giant ball. If it's too crumbly, add more milk. If it's too watery, add more coconut flour to soak up the liquid. 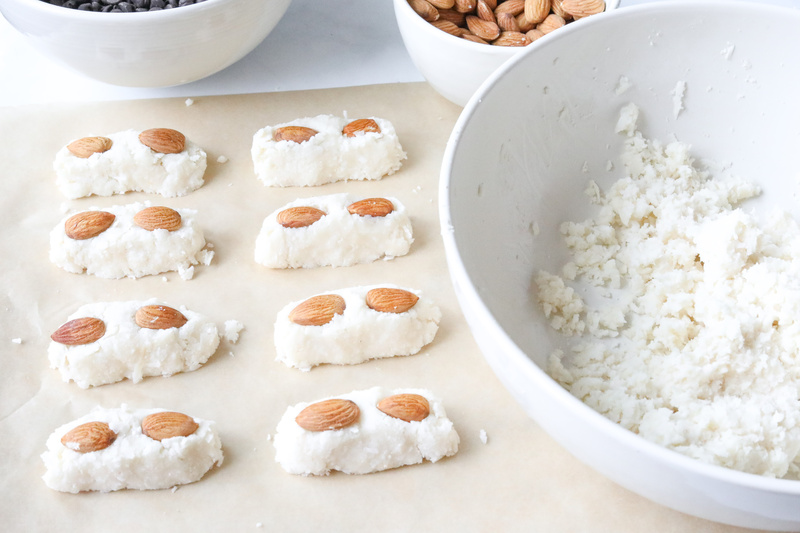 Form the coconut mixture into a mini bar shape. I used about three tablespoons of the mixture for each bar. 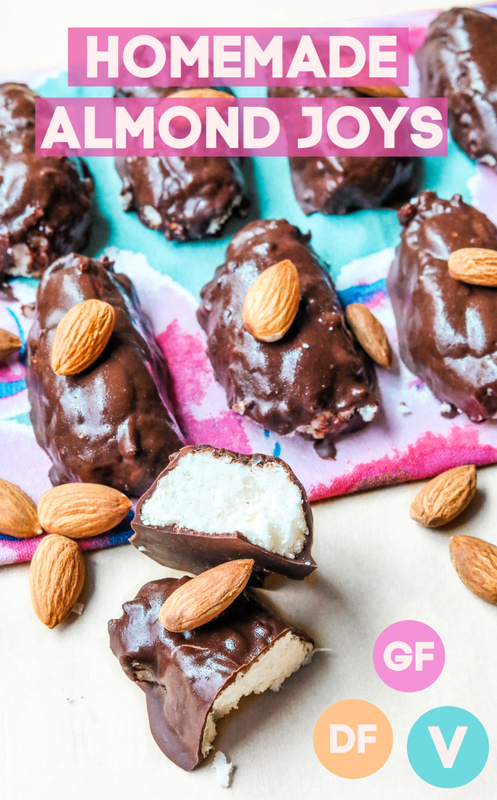 Place two almonds on top of each bar. Melt the chocolate in a microwave-safe bowl. 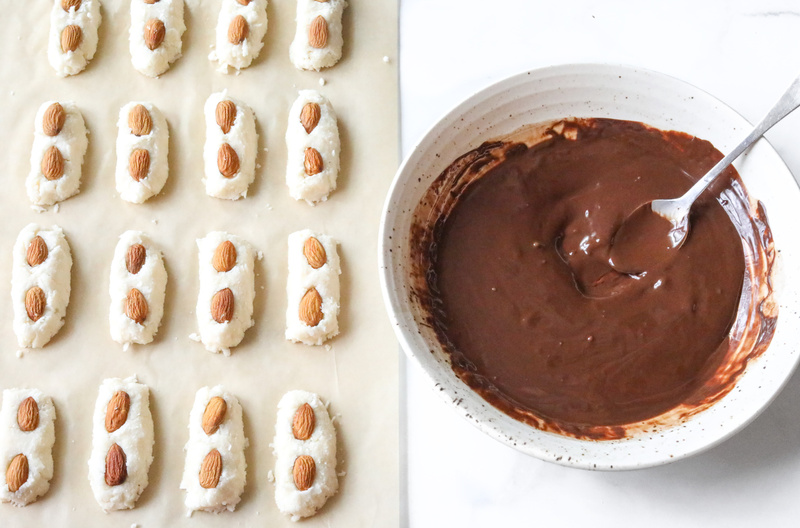 Coat the bar in the melted chocolate and use a spoon to transfer the bar back to a tray with parchment paper. Allow the chocolate to cool for one to two hours. 1. is the almond extract an important part of the flavour? if i dont have it can I sub with vanilla extract, or is it better to just not use other extracts as that could possibly make it taste not the same? 2. how did you let the chocolates cool for 1-2 hours? did you let them cool at room temp or shiuld these be cooling in the fridge so they dont go bad? 3. i was planning on sprinkling them with a flaky salt after coating in chocolate, do u think that would make them too salty as there is already salt in the recipe? I have to make these! My husband and I always stop at the store to get almond joy bars before going to the movies. 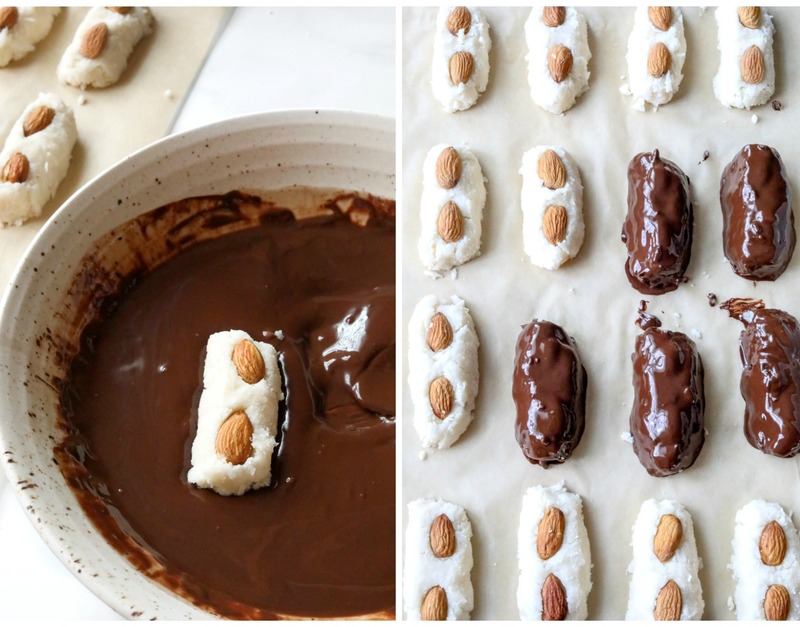 I want to make these into mini bites for our next trip! Thank you for the recipe! I have added this to my weekend plans. Please make Reese’s eggs! I’ve been vegan for five years and I miss those the most. I love Almond Joys too. ❤️ they are so delicious. Oh my goodness I’m going to make these for Easter! Maybe in egg shape? Thanks for the great recipe! Team coconut everything!! Love the egg shape idea!